Every now and then I come across great PC tips and share them with you. A few months back I told you how to put Linux on a USB drive (and why you'd want to), and how to bypass Windows Updates. 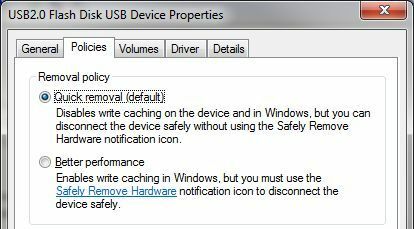 Today I've found some interesting research on using Sleep Mode (vs. leaving a PC running), plus a great tip on how to quickly remove USB devices without hassling with the "Safely Remove Hardware" routine. When it's time to turn in for the night, what do you do with your PC? Turn it off? Leave it running? Put it in standby (aka sleep) mode? Expand Disk Drives, then find the entry for your removable drive. On my system, for example, it's called "USB2.0 Flash Disk USB Device." If the first option, Quick removal, is already selected, you're good to go. As noted in its description, "you can disconnect the device safely without using the Safely Remove Hardware notification icon." If Better performance is selected, switch to Quick removal and click OK.